A 71y.o. woman with multiple sclerosis presents 3 wks after a feral cat bit her on the heel with a rash on her leg. What could these painful lesions be? Contrary to popular belief, cat bites often cause severe injuries. Leave it to a cat to ruin even Christmas. Our patient had cellulitis from a cat bite. In a Mayo clinic study 1/3 of people presenting with cat bites to the hand had to be hospitalized with 85% of bites occur on the hand or wrist where they may pierce a joint or tendon sheath. Antibiotics are unable to penetrate a tendon sheath and surgery is required. In wounds that were cultured in Dr. Talan’s study, aerobes alone were isolated from 36 percent and anaerobes alone from 1 percent so most were mixed infections. Pasteurella multocida was the most common isolate of cat bites involving 75% of cat bites. Other common aerobes included strep, staph, moraexella and Neisseria. Anaerobes included fusobacterium, bacteroides, porphyromona and prevotella. Patients were most often treated with a beta lactam antibiotic and a beta lactamase inhibitor. Usually amp/sulbactam. Clindamycin does not treat Pasteurella. Pasteurella is also susceptible to amp, pcn, doxy, sulfa, fluroquinolones and azithromycin. 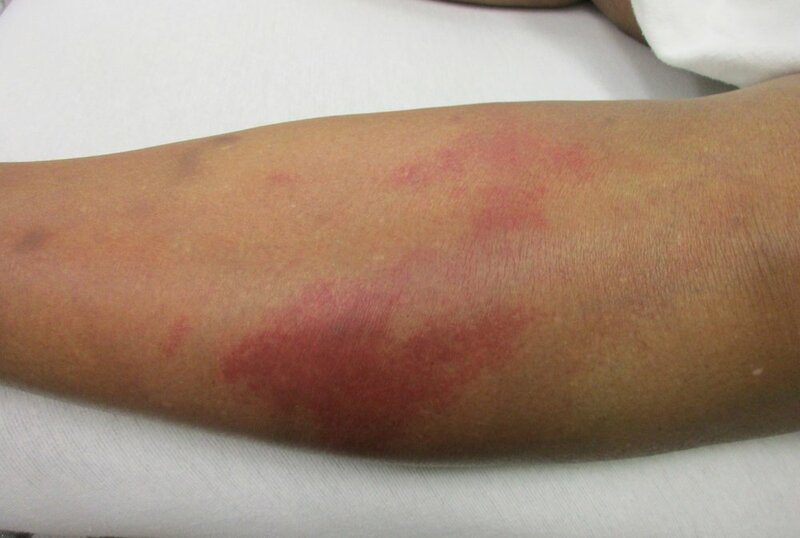 Our patient was pcn allergic and treated with clinda and ceftriaxone for cellulitis. It was felt that she did not have cat scratch fever since it usually present with swollen lymph nodes near the site of the bite which had occurred on the heel and her adenopathy was in the inguinal region. Cat scratch fever, caused by Bartonella henselae , occurs one to three weeks after the bite( sometimes as long as two months later) It is associated with chills and joint pains. Rarely, encephalitis, endocarditis, optic neuritis or oculoglandular syndrome can occur. Immunocompromised patients are most susceptible to these infections. Cat scratch disease can be treated with azithromycin, sulfa or Cipro. There is a PCR test available with a sensitivity of 43-76% but the diagnosis can also be made on lymph node biopsy. Talan D, Citron D, Frederick M, Abrahamian , D, Moran G, Goldstein E. Bacteriologic analysis of infected dog and cat bites. NEJM 1999, Jan 14. Goldstein E, Citron D, Hudspeth M, Gerardo S, Merriam C. Trovafloxacin compared with levofloxacin, ofloxacin, Cipro, azithro and clarithro againt unusual aerobic and anaerobic human and animal bite-wound pathogens. J Antimicrob Chemother 1998;41: 391-396. Rolain J, Brouqui P, Koehler J, Maguina C, et al. Recommendations for treatment of human infections cased by bartonella species. 2004 Antimicrobial Agents and chemotherapy 48(6) 1921-1933.